Image example Di question today na how Carles Puigdemont (L) wan answer Spain President Mariano Rajoy on top dis matter? Spain say from Saturday dem go start to put di region of Catalonia under direct rule, after Catalans dem leader draw ear say im go declare independence from Spain. Di Prime Minister office say ministers go meet to activate Article 155 of di constitution, wey go allow dem begin dey run everything for di region. Catalonia leader Carles Puigdemont bin say dia parliament go vote on top independence, say dem dey do dis one based on their referendum wey happen for 1 October, if Spain. Tori be say many people dey fear say dis one fit cause big fight-fight. Mr Puigdemont bin get final deadline to stop to find Independence from Spain go end by 10:00 (wey be 08:00 GMT) today. If oga Puigdemont no change im waka, then Spain don draw ear say dem go put Catalonia under direct rule, meaning say dem no go get di freedom wey dem get right now to dey handle some things by demself. Na after Catalan do vote for independence (referendum) on 1 October, na im Puigdemont sign independence declaration paper, but im suspend di thing, say make everybodi siddon talk. Tori be say im go continue on top di independence matter, if Spain decide to take direct control. People dey fear say dis one fit cause some fight-fight inside Catalonia. One law wey be Article 155 of Spain 1978 constitution dey allow Spain to force dis direct rule if palava happen, but dem never get reason to use am. As dis deadline dey waka come, people don enter street with vex, protest against di arrest of two leaders wey behind dis independence matter. Politicians for Madrid and Barcelona don dey vex for each other since dis Catalan referendum because Catalan leaders say dia peopel vote 'Yes' for independence but Spain central government say all dis one dey illegal. Wetin Madrid dey really talk? 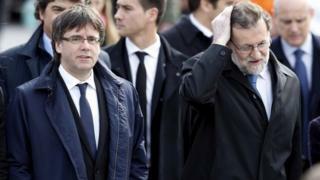 Spanish Prime Minister Mariano Rajoy set di deadline for Mr Puigdemont say make im open mouth talk yes or no whether dem wan declare Independence. Rajoy don also tell Puigdemont to "act with sense." "E no suppose hard to reply to di question: Catalonia don declare independence? Because if dem don do am, di government suppose do one kain action, and if dem never do am, then we fit talk for here," na wetin im say for parliament on 18 October. Dis na di second and final deadline, na im Spain government dey talk. Wetin go happen if Puigdemont block ear? Image example On 18 October, Barcelona football fans say make everybodi talk; dem show dis banner wey say: "Dialogue, Respect, Sport" during one Champions League match against Olympiakos of Greece. If Mr Rajoy decide say im government go put hand against Catalan, then im suppose call special meeting to talk how dem wan begin di matter. Mr Rajoy suppose go one European Union summit for Belgium on 19 October. E dey possible say im go call di meeting before im go, or dem go delay am till Friday. Things wey dem fit do na to take control of Catalan regional police, dem money, or even to call for election there. All dis one never still clear. BBC tori person Tom Burridge say Spain fit dey do all dis one to make sure say Catalonia follow law, and to discipline wetin dem see as government wey no wan dey behave anyhow.